January 18th, 2010 by KTU | Filed under 1. Cabin Plans and Design. 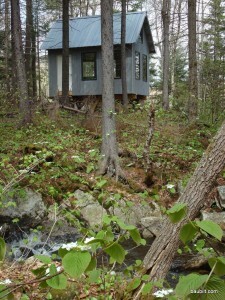 The idea I had was to build a minimalist cabin, roughly the size of Thoreau’s Walden. I sought absolutely zero maintenance, a place I could forget about most of the year, and if I didn’t use it much wouldn’t cause much guilt. My wife doesn’t much like roughing it, and my boys were entering the teen years in which they have heavy commitments on the weekend. Thus, I was pretty sure this was going to be my place. I sleep on the ground quite a few nights a year in various outdoor adventures, so a dry enclosed spot in the woods is luxury living for me when I’m on my own. I also did not want to leave much of a mark on the land. 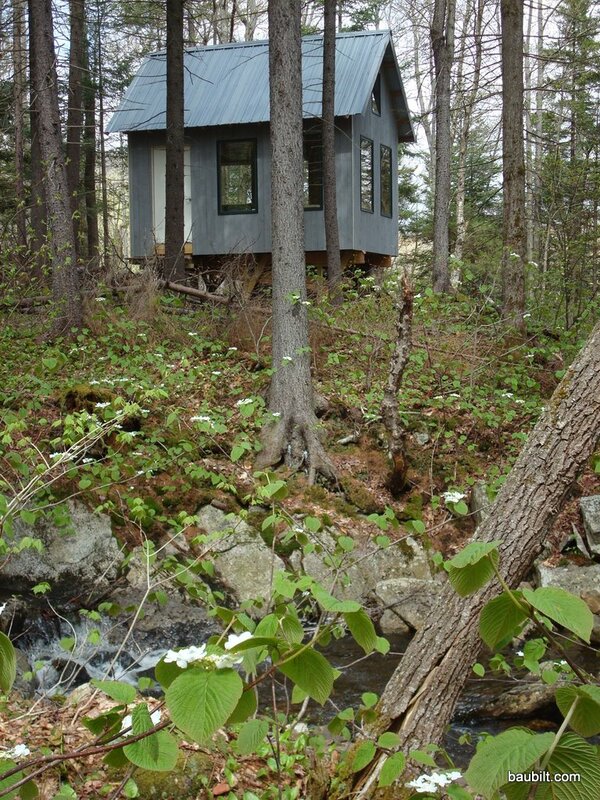 After spending a few days kicking around the site and cutting a few trees down to expose some views, I came to the idea that I would build a 10′ x 16′ structure perched on a giant boulder at the high point on the site, about 100′ from the rushing stream, and a few hundred feet — via a winding little trail– from the road. Furthermore, I decided I could devote about two weeks over the Summer and Fall of 2008 to this project, hopefully involving my sons a bit in the process. Build a “Walden” perched on a boulder a few hundred feet from the road, with less than 14 days of work.